The Bodega Casa de la Ermita is located in a picturesque setting and can be visited as part of the Jumilla wine route, with the old winery located at the foot of the Sierra del Carche mountains which rise to a height of 1,371 metres above sea level. To put that into context for visitors from the UK, that’s higher than Ben Nevis, and most of the vineyards in the area are at an altitude of between 700 and 900 metres. The Bodega is 11 kilometres from the centre of Jumilla town and close to the Carchelo winery and the Bodega Hacienda del Carche. 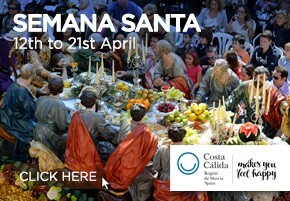 A curiosity of a visit to the Casa de la Ermita is that it takes place in a building where wine is no longer produced. The wine-making activities have been re-located to a new plant approximately 2 kilometres away, and to a certain extent this means that the visit is more to a museum than to a going concern. 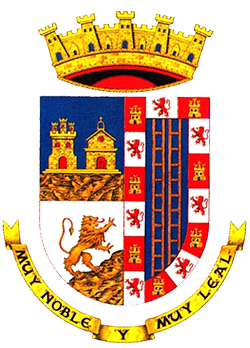 However, this is not a negative point for many people, except perhaps those who have a deep interest in the differing technology used by different companies for the same purpose: for most people, after all, a storage tank is a storage tank and a corking machine is a corking machine, and there is plenty at Casa de la Ermita to make up for the absences of these items in working order. 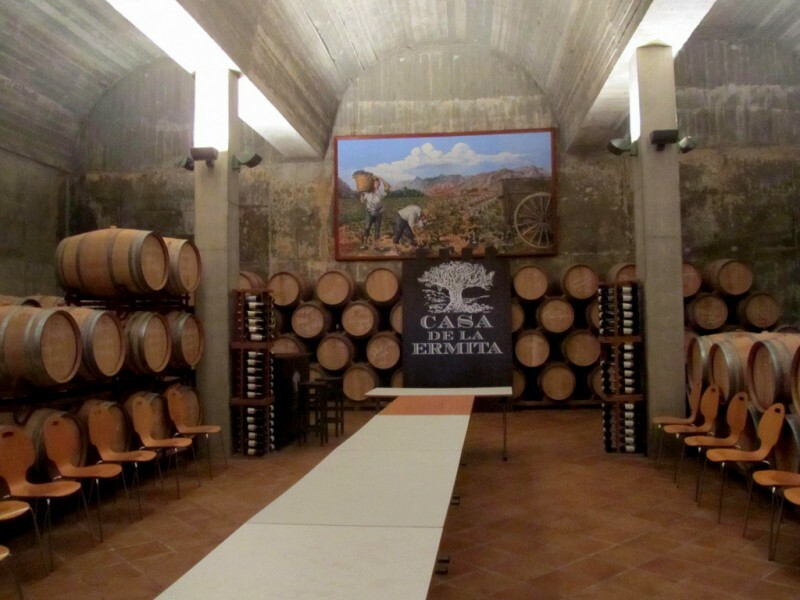 In 2018 Casa de la Ermita merged with the nearby winery of Bodegas Haceinda del Carche, and the products of both labels are now produced at the same premises. The vineyards which belong to Casa de la Ermita between Sierra del Carche and the Sierrecica de Enmedio are in a privileged location in terms of landscape, and the winery actually grows no fewer than twelve kinds of grape here, as well as various varieties of olive. Visits to the winery usually begin with a brief stop in the vineyards, but for those who are really keen to explore there is also a recommended cycle route which makes it possible to enjoy the surroundings more fully. The cycle tour, which is not demanding, can be undertaken at any time, and guided visits can be arranged starting at 9.30 in the morning: maps are provided, and riders are welcome to depart from the set route and explore further afield! Apart from Monastrell the most represented grape varieties are Petit Verdot, Cabernet Sauvignon, Tempranillo, Merlot and Syrah, and all flousish on the high ground which ensures relatively cool night temperatures even in the warm summers of south-eastern Spain. There is also an experimental vineyard where investigations are ongoing into the cultivation of the Viognier, Touriga Nacional, Caladoc, Egiodolá, Rousanne, Marsanne, Gewurztraminer and Malbec varieties of grape. The result is an annual production level in the region of 1.5 million litres, of which 70% is destined for export, principally to Europe although there is emerging interest in both China and the USA. 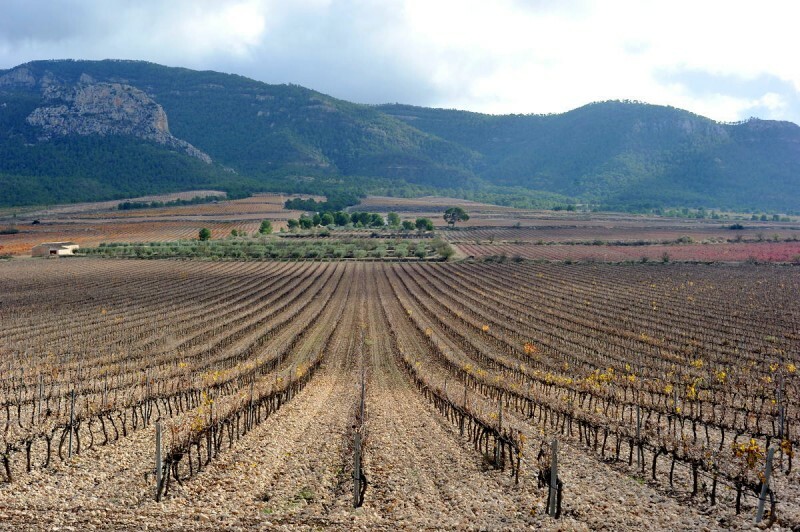 All of the vineyards owned by Casa de la Ermita are run on an environmentally friendly basis, with chemical products such as pesticides and fertilizers being avoided, and the winery was amongst the first to produce fully certified “ecological wine” in the Region of Murcia. 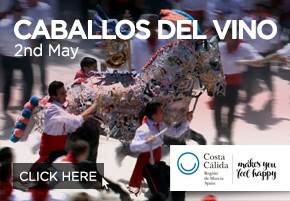 Casa de la Ermita Blanco: a fresh white wine made from 100% Macabeo grapes. Casa de la Ermita Jóven Ecológico: Produced in an entirely environmentally friendly way, this young red is made from 100% Monastrell grapes. Casa de la Ermita Idílico: The classic wine from this Bodega, ideal with game dishes and red meat (65% Petit Verdot, 35% Monastrell). Casa de la Ermita Dulce Blanco: a sweet wine made from the last grapes to be picked (100% Macabeo). Casa de la Ermita Tinto Monastrell: Again, the sweet version is used producing over-ripe grapes, this time Monastrell, to avoid any need to add extra sugar. Perfect with cheese! Casa de la Ermita Petit Verdot: a red wine made exclusively from Petit Verdot grapes. Casa de la Ermita Crianza Ecológico: this is red Crianza Monastrell in its purest form, cultivated with complete respect for the environment of the Sierra del Carche (100% Monastrell). Casa de la Ermita Crianza: another young red wine, this time made from 60% Monastrell, 25% Tempranillo and 15% Cabernet Sauvignon grapes. 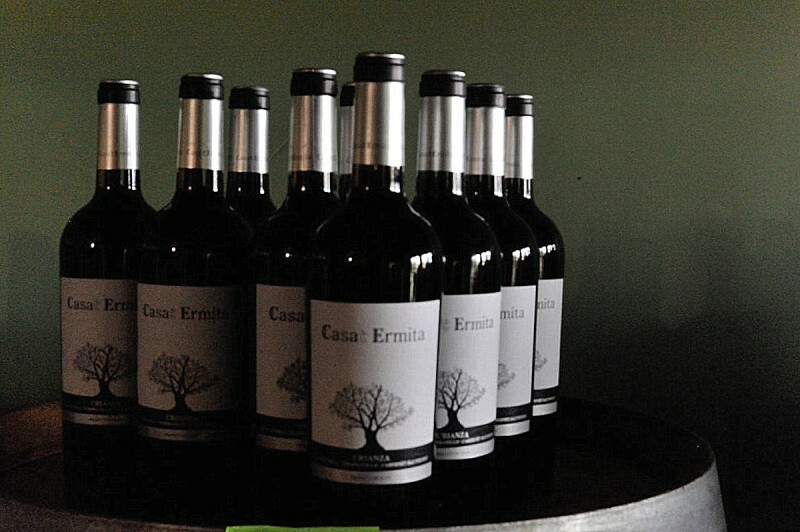 Casa de la Ermita Roble: an 80-20% combination of Monastrell and Petit Verdot grapes, its name comes from the fact that it is aged in French oak barrels. Casa de la Ermita Joven: a young red which combines the character of Monastrell grapes (80%) with the fragrance of Syrah (20%). Lunático: This eye-catching name is due to the peculiarity of the grapes being picked at night, in temperatures which are typically below 15ºC, a process which results in them being fresher on delivery to the winery. 100% Monastrell. Cava Brut Casa Marta: a sparkling “cava”-style wine for special occasions and informal celebrations (Macabeo, Parellada and Xarel-lo grapes). The Casa de la Ermita also produces wine jams, adding just a little sugar to the Dulce Tinto variety and pectin in order to help it to set, the result being a perfect accompaniment for cheese or pâté as an aperitif. Visitors to this bodega will find artisan beer part of the experience, as artisan beers are now being brewed within the premises. Visits to Casa de la Ermita start with a small tour through the vineyards and the experimental plot before visitors are taken to the wine interpretation centre. Here, without using too much jargon or going into excessive detail, the whole process of wine-making is explained in an entertaining way, and is illustrated using photographs and graphics. A small museum area shows some of the tools which were used at Casa de la Ermita before the processes became more highly automatized, and there is also a little fun and competition in the “aroma tour”, which offers you a chance to pit your smelling skills against those of your companions in order to identify different aromas. There is then a visit to the barrel cellar, which is built into the slope of the Sierra del Carche, before a tasting session of four wines at which aperitifs are also offered. The visit ends with a chance to browse the products in the onsite sales outlet, which also offers the wine jams and one of the specialities associated with the north of the Region of Murcia, queso de cabra al vino. This is also produced by Casa de la Ermita, and is made with the milk of Murciano-Granadina goats bathed in red Jumilla wine, giving it a creamy texture and a pleasantly sour taste. The cost of this standard tour is 6€ per head, including the tastings. But as times move on at Casa de la Ermita there is more to the facility at which the tours are based than a simple reminder of how wine used to be made there: the building is now home to a real ale brewing centre, using imported yeast and cereals from Germany, and this provides a chance to sample very different products during the visit! Apart from the standard tour and the cycle tour, other optional extras on the visit include a 100-year-old cave house, which shows how labourers lived, especially during the grape-picking season, a century ago. The house has been restored and now has electricity and a full kitchen. The tour typically begins at 12 midday or 4pm, although can be arranged for groups to suit their schedule and lasts for approximately 90 minutes, and is available in both English and Spanish throughout the week except for Mondays. However, this is a very popular destination for groups of Spaniards, and at weekends the tour guide is usually occupied with Spanish-speaking groups, making it easier to book guided visits in English during the week. Prior reservation is essential at all times. The winery is open to visitors to the wine shop on weekdays from 10.00 to 14.00 and 15.00 to 18.00, and on Saturdays from 10.00 to 14.30. 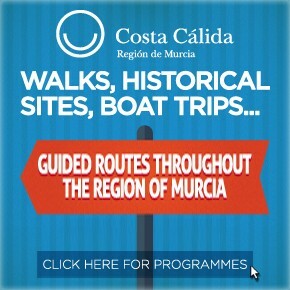 Tour bookings can be made, and further information is available, by telephone on 968 783035 or 607 217018. 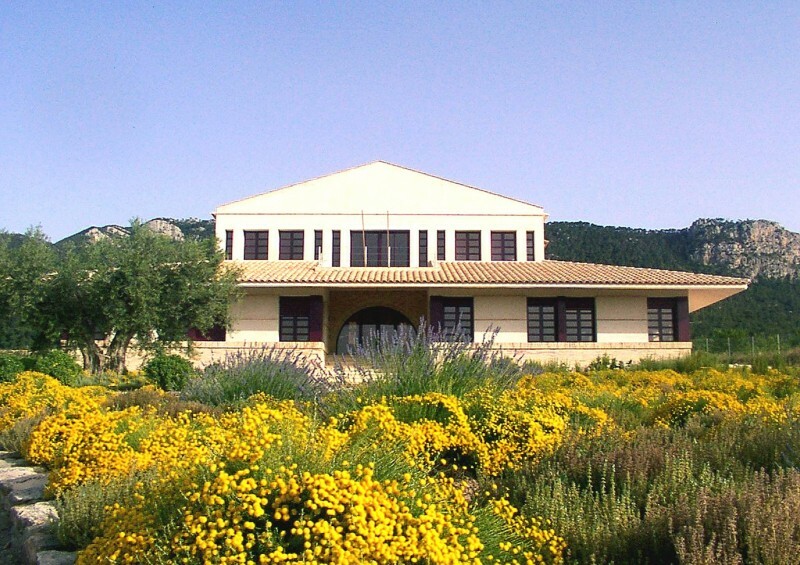 At Casa de la Ermita there is also a fully refurbished house called the Casa del Labrador, which 100 years ago was occupied by those who worked the land and the vineyards. 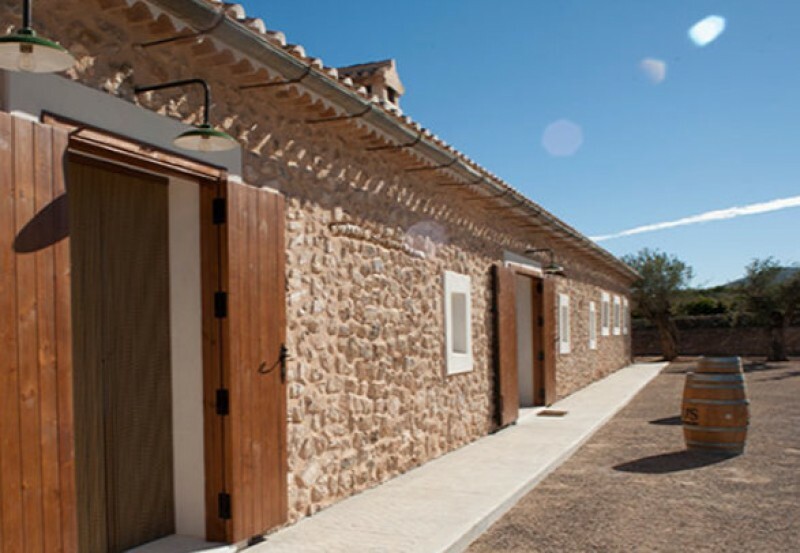 This is available for shorft-term rental, and is one of the favoured locations for visitors enjoying the wineries and other attractions of Jumilla for more than just one day. 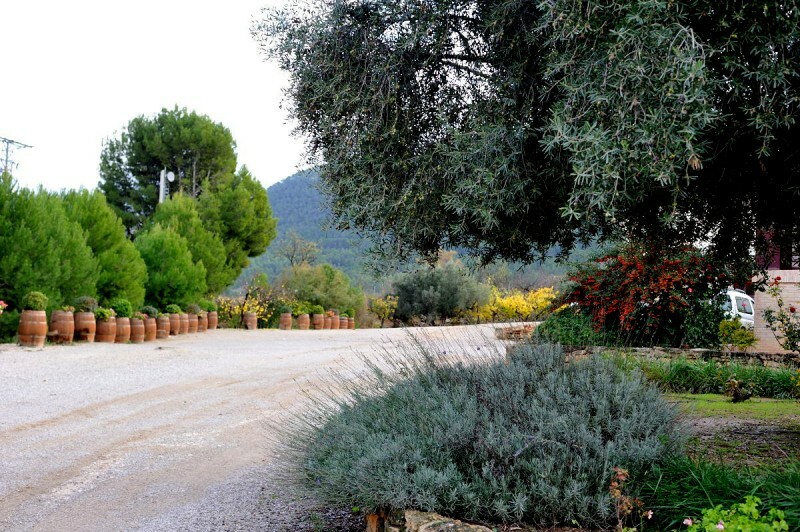 The Casa de la Ermita winery enjoys a spectacularly beautiful location at the foot of the mountains of Sierra del Carche, and is easy to find once the visitor has identified the right road! The Bodega is among those which are signposted at this turning, and is reached by following the MU-15-A road which heads east towards the mountains. 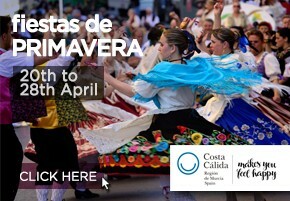 Bodega Casa de la Ermita is on the right after approximately 11 kilometres.